Of the many buzzwords making the rounds in Davos this year, "skills gap" is the most ubiquitous. The great and good attending the World Economic Forum (WEF) have done much hand wringing over how to address what one report termed a "worrying mismatch between the demand for specific skills and the supply of suitable candidates". While there seems to be a broad consensus on what the causes of the said gap are - outdated teaching methods and course syllabuses, and lack of in-work training - there is less agreement on what needs to be done, or who should be doing it. But one unlikely WEF attendee - a 24-year-old from New York who dropped out of Columbia University before completing his degree - is grabbing the attention of crusty executives gathered in this mountain resort. Introduced by global leaders as the "man who has 26 million students", Zach Sims runs a three-year-old website called Codecademy, which enables users to learn six popular programming languages, via a simple interface, for free. Zach is hardly the Davos type - he apologises when using buzzwords such as "intersection" and uses sarcastic air quotes when talking about the WEF's "new digital context" slogan - but he is a vivid example of a "skills gap" victim, albeit a first-world one. "When I was looking for internships in my junior year, at companies like Goldman Sachs and McKinsey, I realised that nobody I was going to college with had any skills that would be relevant in that context," he says. "We were spending our days learning about Greek mythology, and our nights studying thick financial modelling textbooks. "We figured if students at Columbia - a top five school in the country, can't find jobs when they graduate, there was probably a problem." So Zach, with the help of his friend Ryan Bubinski, started to teach himself to code. "We built the first version of Codecademy for me," he explains, and together they expanded the site. 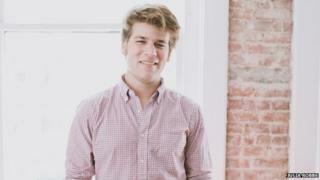 Mr Bubinski became co-founder and the duo launched Codecademy in August 2011. In the first weekend more than 200,000 people used the product - "it gave the ability to send emails to all those people who said the market size was limited," Zach quips, unable to suppress a smile. The site now reaches almost 26 million students in more than 100 countries, and is helping people from all economic backgrounds to "up-skill", including residents of African refugee camps and single mothers in the US. Business leaders may be catching on. A report on "global talent competitiveness" released at the beginning of the week in Davos by business school INSEAD and recruiters Adecco, emphasised that talent was the "new currency of the global economy." It said an estimated 8.4 million jobs were not being filled because of "mismatches in skills and geographies". At a packed Davos lunch event entitled Business Backs Education, featuring a panel including Tony Blair, one chairman cautioned that companies could no longer "stick to the assumption that you get educated for 25 years and then you work for 45 years". Another panellist, US business magnate Stephen Schwarzman, said improving training was "how you deal with income inequality". But while a broad consensus may be forming, attracting investment is as hard as ever. Just 13% of the money spent by the top 500 US companies on social development in 2013 went toward education projects, according to one report. And while the demand for more in-work training is rising, the desire of businesses to provide such opportunities is waning, some say. But if Zach has one message for the Davos elite, it's that employers need to take "a little bit of responsibility", and that the appetite for learning is at an all time high. "Its crazy that two kids could start something in a one-bedroom apartment in California, and educate more people in a weekend than a formal institution could in years," he says. "Education is having a moment".